Which Headset brings you the real Virtual Reality ? It seems like only yesterday when portable virtual reality hit the market, and that’s not a sentiment that’s so far off; it was only last year, but already there are over a hundred to choose from in two main categories – PC-powered VR and mobile phone VR. The differences are quite pronounced, as are the differences in price band, so I got my hands on three different brands to investigate where your time and money should really go. The original catalyst for the virtual reality explosion, from the moment I get my hands on the Oculus Rift (shop it here), it’s clear that this is a serious piece of kit. The headset is sturdy and sleek, the touch controllers feel natural in my hands and the earphones fit snugly. It’s comfortable to wear and easy to set up, although the cost is significant; I’ve had to shell out separately for the touch controllers and earphones, as well as a gaming computer that meets the recommended spec. I’m packing an Intel i5-4590 (shop it here) with a AMD Radeon RX 580 (shop it here) – the minimum spec is advertised as lower but half the titles aren’t available and you’re hit with slowdown issues. All in all I’ve spent $500, not including the PC. It’s like nothing I’ve ever experienced before. Once I’ve fitted it well to my face and plugged it in, I feel completely immersed. The picture is transmitted dually to each eye, and the resolution is pretty good on flagship games such as Valkyrie (shop it here), but a lot of the titles are fairly obviously pixelated. The touch controller works well, and the games are responsive to your movements, synching quite well with head turns up to 180 degrees. It’s after about five minutes though, that the problems begin. Firstly, I feel sick. It’s a trippy experience, and not one that my head is coping well with. Secondly, the headphones have automatically disconnected. Then, I try a new game but I have to take the headphones off to complete the installation, and the illusion is shattered – not that I mind; I feel dizzy and my head is pounding. I go for a lie down and leave it for another day. A lot of people have experienced the same thing, but I would say that perseverance pays off. I can now play for a couple of hours and the only strangeness I feel is coming back to reality after taking the headset off. The range of titles is improving at a rate of knots, and Facebook is looking at a whole new range of options, from meetings to chat rooms. Oculus Rift has come on a long way – it still isn’t perfect, but it has an exciting future. Not everyone can afford the luxurious gaming experience that the Rift brings. Already though, the market is full of alternatives in terms of PC VR and in a different category that makes use of what’s in your pocket – your mobile phone. At just $20, it’s not even on the same planet as the Rift, price-wise. It’s also geared towards your phone – you place your screen inside the front of the headset and away you go. As far as screens go, if you have a 4K phone screen, then the streaming is great. The Elegiant (shop it here) is comfortable, has an adjustable option for screen distance which quickly eliminates any blur, and has a field of vision good enough to watch 360 degree trailers and videos on YouTube without any unnatural feeling. The range of compatible games is growing, and a cheap Bluetooth controller allowed me to access the huge range of Android apps at the touch of a button. Eclipse is the best game I played, but it’s Netflix, YouTube and Google Earth that really provide the excellence and make this well worth buying. Obviously, at a fraction of the price, this isn’t the same level of immersion as the Oculus Rift. I could see the sides of my phone, I’m wearing my own earphones that came with my mobile which lack the 3D surround quality of the Oculus headphones, and after 2 hours of watching, my face hurts from the straps. But it’s been fun, and for such a low price, I have no regrets whatsoever. 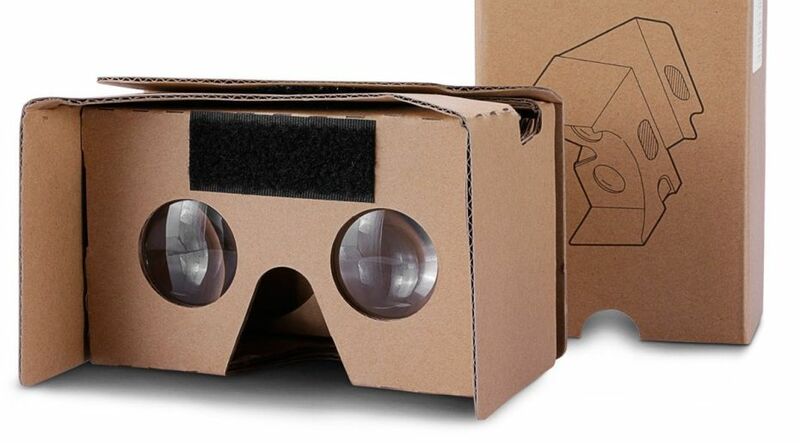 Another entry in the mobile headset canon, the Google Cardboard (shop it here) is made of exactly what it says: cardboard. Unsurprisingly, it comes with all the issues you might expect. Its build is quite flimsy – it doesn’t stay closed particularly well, my phone doesn’t quite fit perfectly, it’s not quite in focus, and unfortunately, after a couple of hours I got up to go to the toilet and when I came back I sat on it and it broke. I am pretty confident that the Elegiant wouldn’t have done so, and the Oculus is as sturdy as you would expect for the price. While the Cardboard is unbelievably cheap – $7 – I have no qualms in paying the extra $12 for the Elegiant, which is essentially the same piece of kit, but will at least last a while. The main question has to be then: Is PC VR worth the extra money? My answer to this comes in two parts. Right now, I don’t think it is. I haven’t played any games that I would describe as amazing, and the Elegiant provides excellent quality on the movie side of things, that doesn’t justify the huge gulf in price. However, this is set to change with the addition of new games and new VR options being developed by Facebook and rival companies, who have clearly decided to put in some serious investment for 2018. It might be worth waiting a year and then taking the plunge, but for the moment, the Elegiant wins my vote.